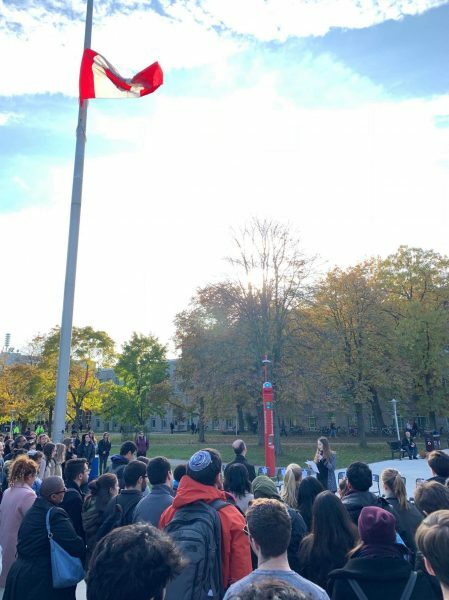 On Oct. 30, McMaster students, faculty and staff gathered on the field near Burke Science Building to mourn the deaths of the 11 people who lost their lives during the Oct. 27 Tree of Life synagogue mass shooting, committed by a man espousing Nazi rhetoric. 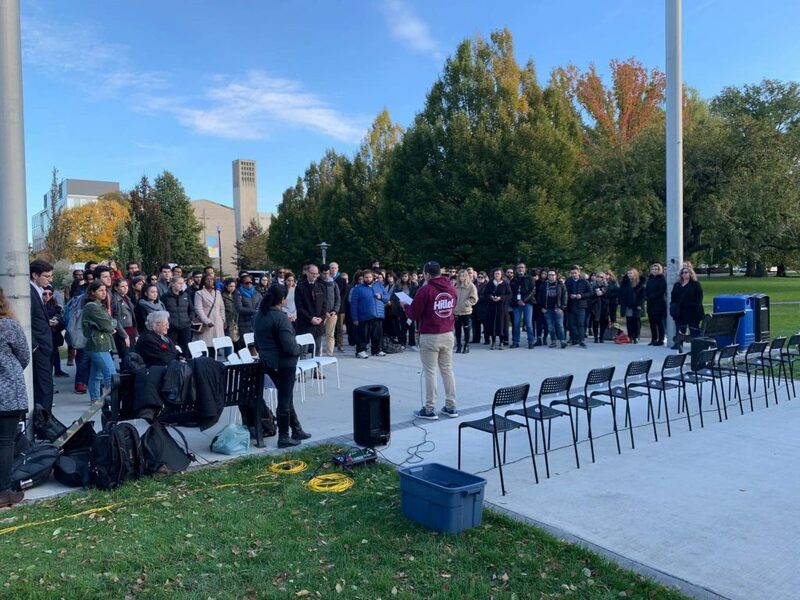 The McMaster community was joined by rabbis and Hamilton community members as they addressed the tragedy that unfolded the previous weekend. The vigil, organized by McMaster Hillel, the Jewish community organization on campus, sought to honour the victims, reflect on the pervasiveness of anti-Semitism and encourage hope and a united community. At the memorial service, Max Librach, the president of McMaster Hillel, spoke about the victims and the relationship between the tragedy and his own experiences. “I myself was praying in a synagogue on that same day. I do not for a second forget that this could easily have happened right here, in my own community,” said Librach. Fourth-year McMaster student Max Greenberg recited El Ma’aleh Rachamim, a prayer for the departed soul of the dead. Greenberg’s prayer was followed by a poem about the Pittsburgh shooting. After the poem was recited, a few Psalms and the Mourner’s Kaddish, a prayer recited in memory of the victims, were said. The mourners were joined by members of other faith groups who expressed their commitment to advocacy and combating anti-Semitism and discrimination against marginalized communities. Rabbi Hillel Lavery-Yisraëli of the Beth Jacob Synagogue in Hamilton praised the Jewish community’s sense of unity and solidarity. “We must draw strength from our community, our peers, and the communities of friends and supporters we are fortunate to have, and forge on forward, actively fighting hate and bringing about a better tomorrow,” he said. In the multi-faith vigil co-organized by Rabbi Hillel later that evening at Temple Anshe Sholom, several faith leaders joined mourners in addressing the importance of togetherness and solidarity. Judith Moses Dworkin, the director of McMaster Hillel, encourages and appreciates the allyship during this difficult time. “We know that we have many partners on campus who continue to show us their support. We urge our friends in other communities to join us in speaking out and countering anti-Semitic hatred whenever and wherever it rears its ugly head. Only together can we truly heal from events like these,” she said. Anti-Semitism continues to manifest itself in Hamilton, both subtly and more overtly. According to the CBC, in 2017, Jewish people were the most targeted group in religious-based hate incidents in Hamilton. In the recent Oct. 22 municipal election, Paul Fromm, a self-proclaimed white supremacist associated with the neo-Nazi movement, garnered 706 votes. “We have experienced some anti-Semitism in Hamilton over the past few years, but nothing more than graffiti, threats, and publication of a hate newspaper,” said rabbi Hillel. “Nonetheless, after the attack we are all feeling afraid and vulnerable. When all is said and done, we are not that much different from Pittsburgh,” he said. McMaster Hillel is hopeful that they can support the Jewish community in the wake of the tragedy and increase public awareness about anti-Semitism and hatred on campus and in the community.